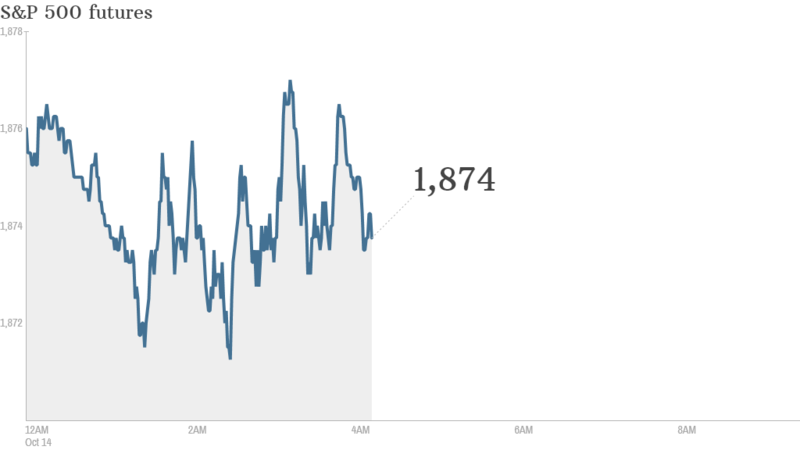 After a series of rough trading sessions, it looks like stocks may be primed for a rebound. 1. Time for a bounce? : U.S. stock futures are pointing higher after three consecutive days of punishing losses. While stocks may not register a serious pop when markets open, they should start to claw back some of their losses. Looking at commodities, oil prices are declining and gold prices are rising in early trading. On Monday, the Dow lost 223 points, the S&P 500 slid 1.7%, and the Nasdaq ended the day 1.5% lower. Each of the major indexes have declined by 4% or more over the past three trading days. CNNMoney's Fear & Greed Index -- which indicates market sentiment -- was at zero Monday for the first time since August 2011. That indicates fear hit its peak, a huge red flag for investors. 2. Expecting earnings: A number of prominent companies will report earnings Tuesday. JPMorgan (JPM), Citigroup (C), Wells Fargo (WFC), and Johnson & Johnson (JNJ) will post before the opening bell and Intel (INTC) will release them after the close. Shares in Intel are edging up ahead of the open. 3. Market movers -- Iliad, Burberry, Carnival: Shares in the French telecom Iliad (ILIAY) were surging by about 12% in Europe after the company announced it was ditching its bid to buy a majority stake in T-Mobile US (TMUS). Burberry (BURBY) shares were down by over 5% in London after the company warned that it was facing a "difficult external environment," even though sales surged over the first six months of the year. Shares in cruise ship operator Carnival (CCL) looked set for a modest 1% recovery after falling by nearly 15% over the past five trading days. The company's stock has been slammed over fears that Ebola's spread will hurt cruise sales. 4. International markets overview: European markets were lower in early trading. This comes as an important economic indicator in Germany shows sentiment is at its lowest level since late 2012. Most Asian markets ended with losses, except for the Australian ASX All Ordinaries index, which jumped by 1%.